Okay, whats up for the celebration?????? Take a glass tumbler and line it with a thin slice of cake. Now crumble the chocolate chip cookies and line it over the cake. (I used hide and seek biscuits). Now melt half a bar of chocolate with 1 tsp of butter in a double boiler to make ganache. Top the cookie layer with the ganache. Prepare the custard according to the instructions in the pack. I would suggest you to make the custard thick in consistency by adding less milk to it than required. Once done allow it to cool and then top the ganache layer with this custard. You can actually swap the ganache and custard layer order too. Take a glass tumbler or a bowl and line it with a thin slice of cake. Dilute the honey with some water and drizzle it over the cake to keep it moist. 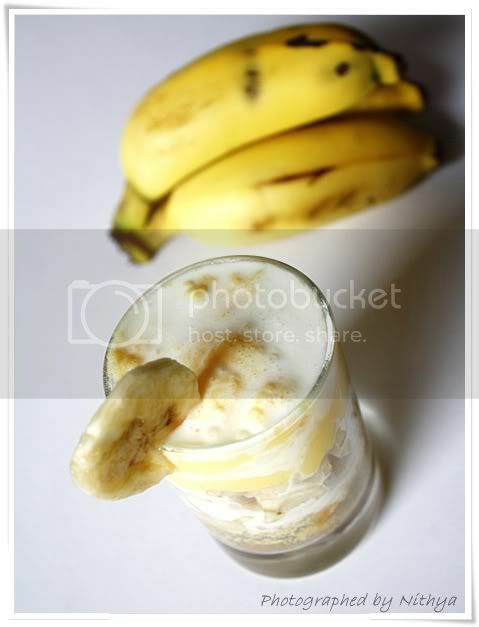 Now layer it with thinly diced banana. Now make the custard according to the instructions in the pack. I would suggest you to make the custard thick, hence add less milk to it than required. Allow it to cool once done. Now add 2 tbl spn of it on the banana layer. The procedure is just like the banana triffle. :) Arrange them in layers and serve chill. Lovely pics...ur SLR is getting into work. I wud opt for Choc flavour. Nice pinky template with cute icons on the right quick index. Congrats and wishing you many such blogging years! Love the new look, yeah i woud also love the chocolate one for me too. Congrats on your blog birthday. Wish you many more years to come. The desserts look delicious. And the new name is really good. We are all happy for you- to find one's passion and interest is one of life's treasures, but feeling moved to share it with others is our treasure! Thank you. It really shows in all you do! I am moved to say, I want some of that banana desert. I miss those 'kutti' bananas. We don't get them here in US where I am. The taste is amazing! What an awesome journey you have made Nithya. Congrats on completing a very successful one year and for transitioning into a dot com and your the newname/newlogo. I love the new look, the new logo and of course always your photography and presentation. Can I adopt you as my little sister? Those triple trifle are a triple treat for you triple milestones. Congratulation on ur First Blog Anniversary dear!!! 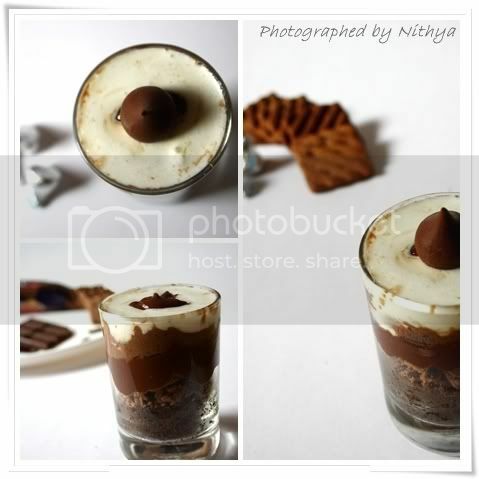 Love the chocolate trifle a lot!!! Love the new look of your blog:) Congrats and wishing you many more blogging years! My hearty wishes for your success with this blog Nithya! Keep up your good work going on and on and on. BTW, your new look of the blog is amazing!!! 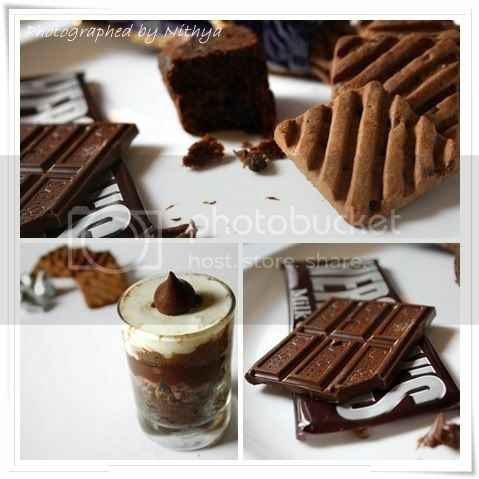 Everything is nice,own space,new looks of ur blog,photography with slr and also the trifle! Enjoy Nitha,we too will sure enjoy! Nithya, I am out of words..I am in awe...Absolutely gorgeous! Congrats dear, keep rocking and wish you many such lovely lovely occasions!! Blog looks cool with the new make over! Hey btw, did you use "Blogger" to move to your own domain? I'm totally amazed with ur creativity and stylish photography skills Nithya! Love all those trifles! Excellent work! Congrats on your successful transition Nithi. Wish you good luck in this year too and forever. Wonderful way to celebrate your blog's birthday!!!! Keep going. 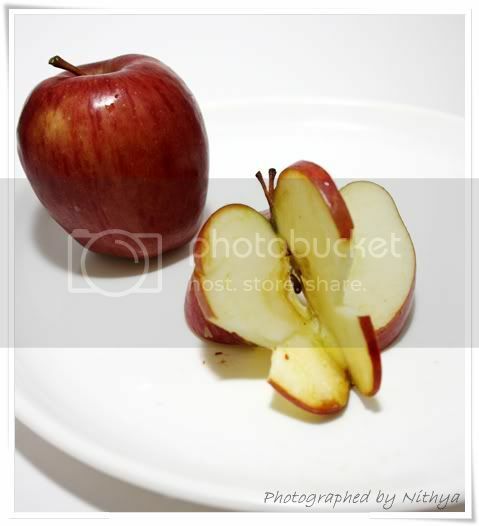 Congrats on your 1st blog anniversary....great going Nithya.....lovely template. Trifle is my all time fav, loved the choc the best :). Congratulations on your first birthday 4th Sense - love the new name and the new style! Looks like your SLR is soon going to be immersed in the smell of good food! 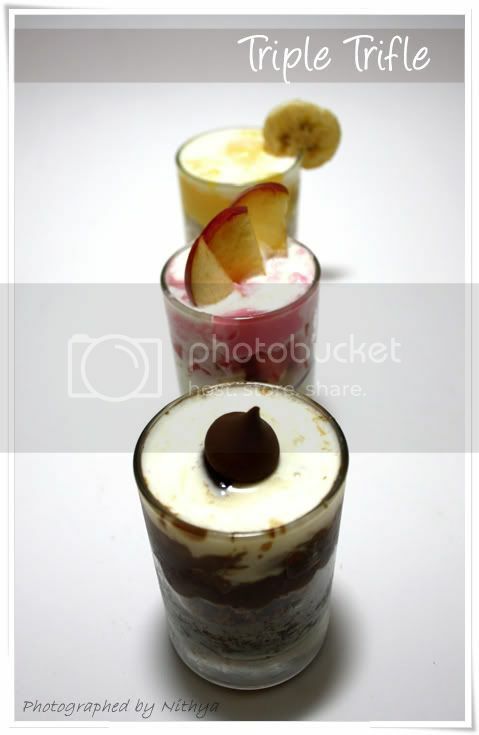 The trifles look awesome - I have to go with my chocolate one of course! As usual your pictures look very interesting!!! Congrats on your blog birthday Nithya..and what a wonderful gift to oneself..own domain..wow! !Way to go!! Congrats and wishing your blog a very happy birthday!! Congrats on the new milestone! And your blog template is adorable. great work. And the trifles have a great reason to celebrate! Congratulations on ur 1st blog ann. Loved all the trifles. Clicks are too good. Congratulations Nithya !!!!. I've always loved and admired your photography and presentation and ur passion for food. Happy 1st blog anniversary and a great pinky pink look for ur blog and happy that u have ur own domain and are Now a .COm..Congratalations on all ur milestones..and looking fwd to more of such amazing posts/recipes fm you. 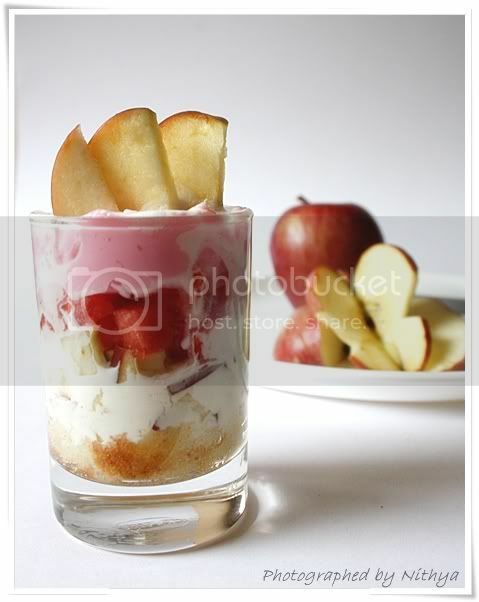 Love ur selection of Triple Trifle post for ur celebration.. My favorite wd have to be the Apple Triple..it looks so refreshing and healthy..also v colorful. 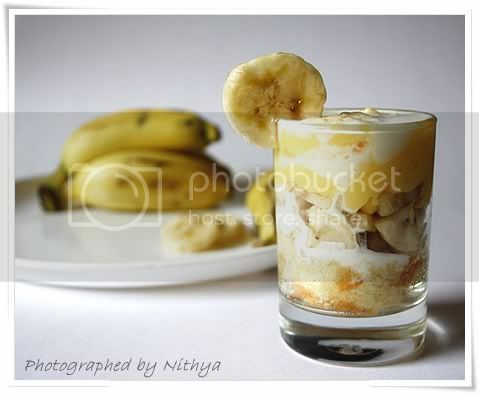 congrats nithya!...wonderful and delicious desserts....looks very colourul, cute and lovely presentation! great desserts.Will give a try soon,when vacation starts for kids. Congrats dear! Wish you many more such happy occasions:) And simply loved the template! Ah! The pink dress suits your blog well Nithya! Looks lovely! And to top it the trifle's are amazing with their own vibrant colors and texture! Congrats on your blog's new dress..I mean Look:), new home and definitely your new camera! Happy Blogging! Lovely pics. Couldn't take my eyes off. Thanks for stopping by my blog. I'm following you too. hi, ur recipes r great, keep the good work going, congrats. Those deserts look lovely Mmmmm!!! I have only just lost 7 stones in weight and beleive it or not I didnt diet. I did it eating all the foods i love so your deserts are on my menu! Great Blog. It looks fab. I have fallen in looove with ur blog!! Its seriously awesome! Hey i have an event going on in my blog rite nw!! Plzzz do check it out!! This post will help me der! Thanks ALOT!